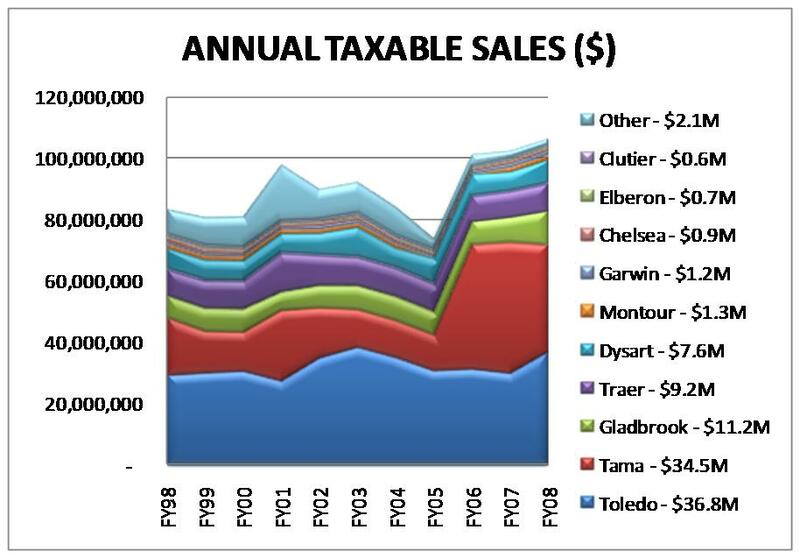 Toledo contributed the lion’s share to the taxable sales economy, and maintained the trend over the past decade. Number of businesses however are slightly less than Tama’s at 439. Tama is one of the remarkable success stories across the state where taxable sales more than tripled from FY05 to FY06, ultimately increasing 82% over the last decade. During this period of success, the number of businesses dipped slightly from 514 to 450. Gladbrook’s per capita output is most significant as a town with 4% of the county population has the 3rd largest taxable sale economy producing 11% of the output. 191 businesses have been contributing to this success. Traer had 327 businesses 10 years ago and produced annual sales on par with 514 businesses in Tama. Over the past decade Traer has demonstrated remarkable consistency in maintaining this level of annual sales and number of businesses. Dysart’s 278 businesses also grew in both number of businesses and taxable sales economy. Preliminary numbers on FY09 indicate that Dysart has continued its growth trend even through the recession. In the smaller than $5 million markets, Garwin’s 105 businesses, Chelsea‘s 90, Clutier’s 75 and Montour‘s 51 each had grown in number of total businesses. Elberon and Garwin demonstrated the strongest taxable sales and services growth over the decade at 47% and 48% respectively. During this same decade of significant sales growth, number of businesses started to increase after 2006 to a total of 2,178.